1. Identify why overtime is needed. 2. Eliminate activities that waste time in your workforce. 3. Look at automating tasks that take a lot of time to complete. 4. Ensure you have the right people doing the right job. 5. Track employee performance to identify possible problems. 6. Monitor breaks and time in and out. 7. Use a staffing agency when demands peek. 8. Use project managers to push efficiency and reduce wasted time. 9. Communicate cost with employees and stress success depends on keeping costs down. 10. Ask for feedback from employees on how to improve efficiency. Not only does overtime rank as one of the biggest ongoing expenses for most companies, but the correct, or incorrect, management of overtime can mean the difference between expensive lawsuits, low morale, and vulnerability to changes in overtime regulations. One of the largest single expenses of every local business is labor. A good rule of thumb is to keep labor costs under 30% of revenue. Nothing can make labor costs creep up quite like overtime — that time-and-a-half your employees earn when they stay late or arrive early. While the U.S. workweek is officially 40 hours, Americans have been known to work long hours. 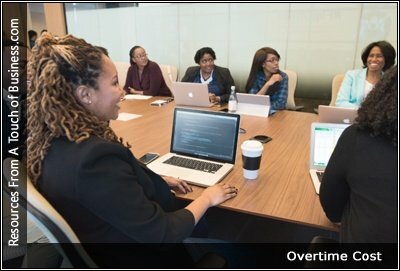 While overtime is often used in the heat of a difficult moment, it can also be successfully incorporated into an organization’s business plan. If your organization frequently relies on employees clocking extra hours, consider an overtime audit. It important to recognize that 50% or more of overtime is due to lack of labor planning, failure to meet performance expectations and lack of real time visibility to work progress. Mounting overtime pay, where each overtime hour can cost “time and a half,” takes a toll on a manufacturer’s payroll expense.